Anzac Day – time to pass it on? 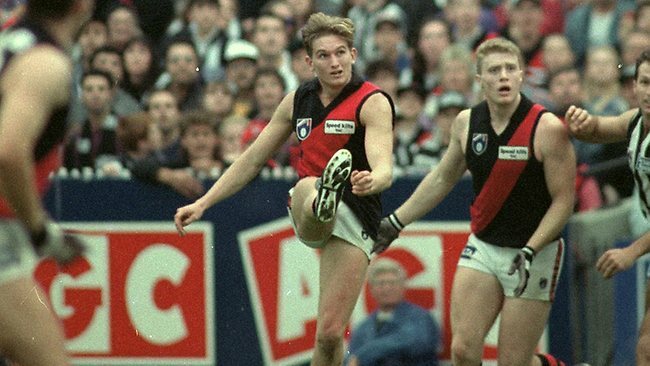 It’s hard to believe that it was 18 years ago that I traveled to the MCG to see the Bombers take on the Pies on Anzac Day, completely unaware of the history that was about to unfold. I remember it being a bright, warm day, and the regular amount of seats left unattended or covered in bags and jackets quickly being removed an hour or so before the game for the masses of patrons that were streaming in. The ground felt fuller and fuller, and as a fan, you always want that. Big crowds mean a bigger atmosphere. Big atmospheres lead to great games and memorable moments. The gates have been shut. This place is full. We weren’t to know then that the epic draw that played itself out that bright, sunny day would initiate of the game’s great traditions. Two of the biggest teams in the country, in terms of followers and premierships have been going at it for 18 years straight now. As a fan, and as a fan who has attended a lot of these games, it’s the biggest regular season game by far. Firstly, it’s Collingwood. Enough said. You want to beat them. You want their fans to go home disappointed. If you could be guaranteed one home and away victory, this would be it, no questions asked. Secondly, there’s something strangely magnificent about a silent crowd of around 90,000 people at the MCG, pre-game on Anzac Day. The playing of the last post followed by a minute’s silence is not quite eerie, but it’s certainly special. The roar that follows the national anthem is only bettered by a key final. And I wonder if fans from all teams should get to experience it. I don’t think it’s sacrilegious to suggest that these two teams shouldn’t have moral rights to this event for the rest of eternity. I know that the Bombers and the Pies ‘got there first’, but this isn’t bustling over the rights to a piece of play equipment in a children’s playground. I think all fans should get to experience the anticipation of knowing that you will be in the spotlight for the biggest home and away game of the season. We’re all aware that other teams do get to play on Anzac Day, later that night or even in other states or countries, but trust me, it’s not the same. The best football ground in the country, middle of the day, centre stage; it does not get any better. Other suggestions have included all teams rotating through over a number of years or having multiple matches on the day. But another alternative that stands out is to reward the top 2 teams from the end of the previous home and away season. As distinct from a grand final replay, this provides another carrot for the teams battling it out for the top of the table. Finals are a funny dynamic and nothing is guaranteed for the teams that finish on top, as it should be. But to at least be rewarded with the premiere slot on Anzac Day the following year would be a just reward for finishing first or second, ridiculous, unfair draw notwithstanding. It would also guarantee that the game itself is played between two strong teams. As much as I am for new teams being given access to the great day, no offence*, but Bulldogs v Kangaroos or Melbourne v Port Power wouldn’t float anyone’s boat. Two high finishing teams from the previous season would preserve the integrity of a good contest. 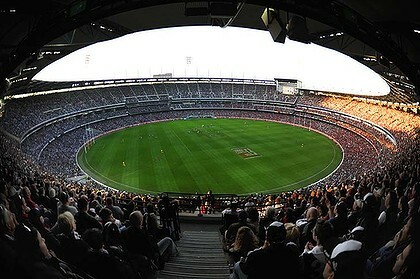 Regardless of any changes that might be forthcoming, and there’s no noise from AFL House about this particular one, the event itself remains one of the true great traditions of the Australian sporting landscape. I’m still uncomfortable with the analogies of war that arise in relation to a game of football. But that reflects present day hyperbole and we’re not going to be able to remove ourselves completely from it. What our past and present men and women have done to preserve our freedom is the true focus of the day. The rest is mere distraction. Posted in Sport and tagged 12 months off sport, AFL, Anzac Day, Collingwood Magpies, draw, Essendon Bombers, James Hird, MCG, my year without sport, no sport, sport, sports, year without sport. Bookmark the permalink. Hawthorn – Geelong is about the only other contest I’d prefer to see this replaced with and I’m not a Pies or Bombers fans. As for the analogies of war, yeah thats the football world and the media taking themselves waaaaay too seriously. 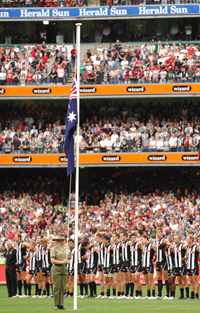 I remember sitting at Waverly watching the Hawks on an Anzac day, obviously 19 years ago. Cause I really don’t care anymore I say leave it, traditions are dying. It makes so many C and E bogans happy! !